I lived and traveled in Europe and one of my favorite past-times was going on pilgrimage. I have a knack of finding out of the way Sacred Places. Pilgrimage for me was a way of life. I have been living in the USA the last 3 1/2 years and there has been a longing for the pilgrimage trail. 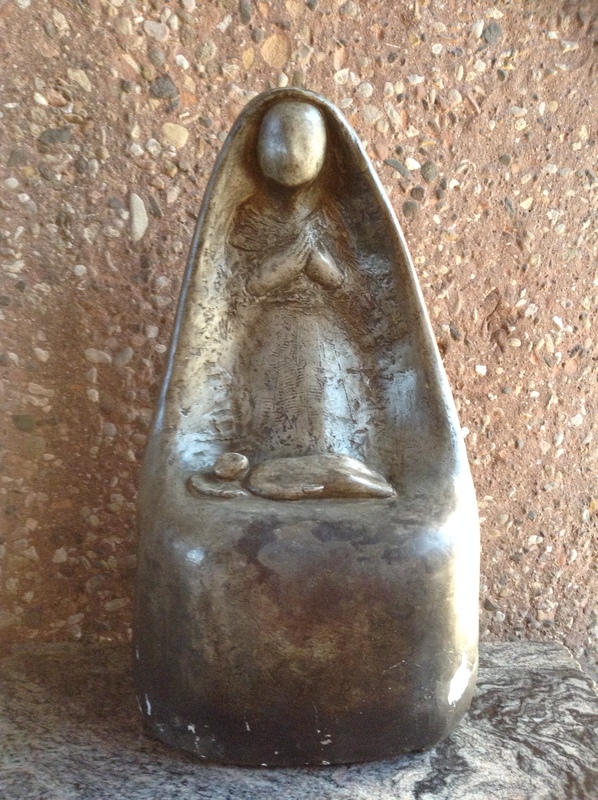 Everyday I walk and do my prayer practice in the red rocks of Sedona, but there still was this longing in me to connect to healing shrines of the Madonna. “Sacred Pilgrimage is both an inner and outer journey. It is designed to open us up to awakening and seeing life from a sacred point of view. A pilgrim may begin the journey because he or she is in need of a healing (such as a pilgrimage to Lourdes). However, what makes a journey sacred is the focus and intensity of a pilgrim’s prayer, meditation and purpose. The proper approach to a sacred site is the key that can decode the secrets and the truth that is hidden from the masses. I would like to make a few suggestions. Following them I have found deepens my experience when visiting sacred places. Every Sacred Site has its own history and vibration. If you can understand the power of a particular site, then you can begin to understand how to align yourself with the site you are visiting. This book will be a guide to understanding both the vibration and also the ley-lines of the lands. It is very important to understand the power of the land that creates a Sacred Site. You could also become aware of your inner process before you visit a site. I have found many times that when a particular issue within needs healing, it will arise the day or night before I visit the site. Because of this I usually pray or meditate the evening before. This prepares me for initiation. A few days I go I decided to visit the Chapel of the Holy Cross. The first time I visited this shrine was in 1982 passing through the Southwest. The chapel is chiseled in the red rock landscape of Sedona AZ. I had tried to visit this chapel in the red rocks several times in the last two years, but I became discourage. There were so many tourist and the parking was impossible that it just shut me down to the whole process. But something happened that was different this morning. It was 7:00 in the morning and I just wanted to drive toward Oak Creek to grab a cup of coffee and a get one of the best bran muffin in the county at one of the local coffee shops. I was making my way back home when I looked up at the Red Rock Shrine and decided I wanted to go. The parking lot was empty to my great happiness! It was that time of day that the lyrics of song birds filled the air…And pair of deer caught my attention scampering in the morning sunlight. The path up to the shrine was a curve that hugged the ley of the land in the most graceful manner. I passed by a small miniature garden with a Guardian Angel standing in the mist of blue rosemary flowers. 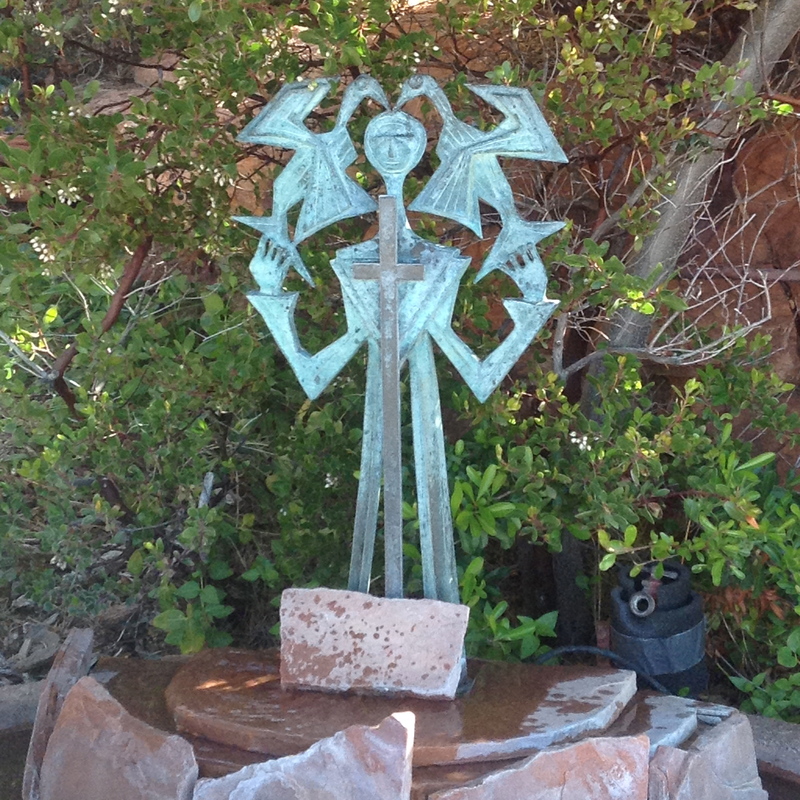 A fountain of Saint Francis with flying birds around his head was artfully expressed in metal sculpture. The natural red rocks of the landscape that surrounded the area were breath taking to witness. The doors of the chapel were wide open and welcoming. I walked through and place my fingers in the Holy Water fount to bless myself before I settled down in meditation. There was a cross built into the architecture of the building. I began to go into meditation, the inward experience was spiritually going vertical in consciousness. Everything in the structure even the outer shape of the building supported one to settle in silence and rise into the Godhead. This experience made me reflect on what is the cross as far as sacred geometry? laying a side it being a tool of torture for Jesus. What was my experience of the cross? The vertical pole of the cross was the outer symbol of being connected to one’s Higher Self, the God Head, the Source, returning to your original state of being. The horizontal pole of the cross was that Higher Self entering matter. I went deeper into the very center of the cross which was inside of me. It was located in my heart….the transformational chamber where all experiences need to become integrated into one’s human existence. The alchemical process of the many layers of the human heart sooner of later brings one into the heart of Silence. This was the Way of all great saints, mystics and sages. Deeper I breathed into this mystery passing my own layers of resistance, my own judgements and suffering, to settled down into a Silent Heart. No thoughts no words just the flicker of candle light and being Presence, watchful and available to what was before me. 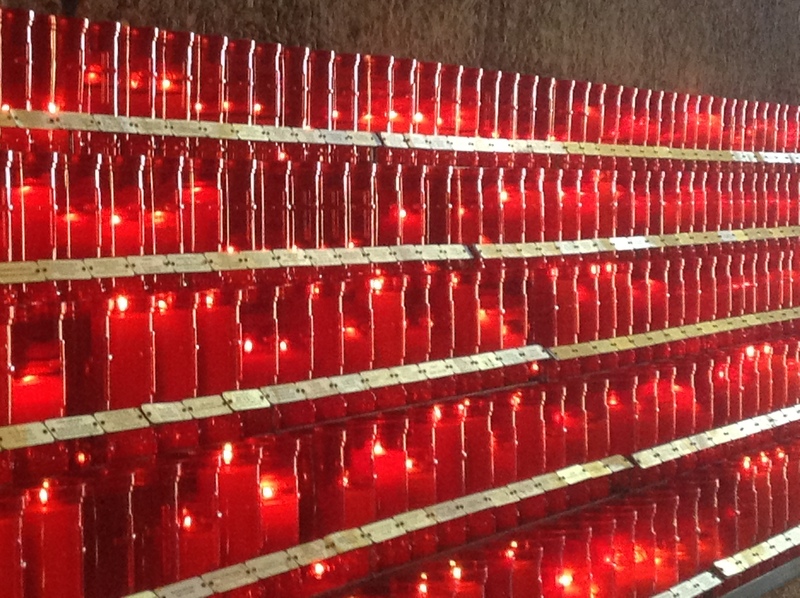 Two custodian were in the process of lighting rows and rows of candles for the day. The very moment was all that was left to enjoy, for everything else in my mind had fallen away. I finished my meditation lit a candle to join the many flickering flames and walked to the back of the chapel. There in the corner where a sculpture stood was a Black Madonna. It was made in modern style, the lines smooth flowing. The Madonna and Child had no face, no features…..she was the original face of all of us, before we were born……She reminded me of returning to our original innocence. I turn to the altar and there above the altar was the mask of Christ…..this was an unusual feature to have over an altar. But as I sank deeper into this mystery… is it not the mask of Christ we see in humanity? But we have fallen asleep and become blind to the Christ in our fellowman, in fact everything in creation is wearing the mask of Christ…but our eyes have not been able to penetrate the mystery……It is the returning to our own original face of innocence, returning to the tender heart of Silence the mystery can be taken fully into our being. I am so grateful for touching the mystery of the Shrine of the Holy Cross and returning to the steps of Sacred Pilgrimage now here in the United States it fills my heart to be Home. The Chapel of the Holy Cross was built by Marguerite Brunswig Staude a local rancher and sculptor of the area. The architects Richard Hein and August K Strotz were hired for the project. August Strotz executed the design of the chapel. Frank Lloyd Wright acted as inspiration to Marguerite Brunswig Staude in the beginnings of the project, in 1932 when Marguerite wanted to build the chapel in Europe. But World War II came into play and the project was abandoned. 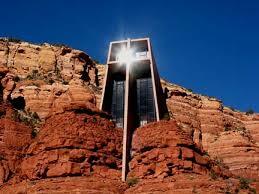 The Chapel found it’s home here in Sedona AZ. and was completed in 1956. Note: It was in 2007, I had visited another Chapel of the Holy Cross, “Chapelle de Sainte Croix”. The Chapel was part of the Montnajour Abbey in the South of France, outside of Arles. It was built to house the relic of the true cross. This 12th century chapel is considered a Romanesque master piece of architecture.